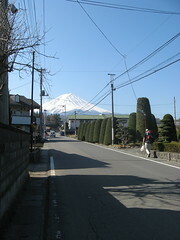 The haze was gone this morning and in the clear and chilly air we walked to the station. We had a much more interesting room mate last night. I’d heard him earlier debating the origins of zero and this morning we spoke about Kyoto. He also had reservations about people who bring kids to youth hostels (because of the racket from the next room) but I could reassure him that as one of four children taken around Europe in a combi van I loved it and never saw anything dodgy going on amongst the youths. Despite my earlier confidence I was reminded today that really I know nothing and conversations that deviate even slightly from the phrase books are nigh impossible. A bus to Gotemba and then another to Mishima from where we took the shinkansen (bullet train) to Kyoto. It seems I may have some trouble brewing with my foreigner registration card. A couple on the bus told me it takes two weeks and has to be collected from the same office you apply at. Hopefully I can convince them to send it to a friend in Nagano instead. Our hostel in Kyoto is still under construction with two more showers arriving tomorrow and plastic wrap still on shelves and bedposts. We’ve wandered down some covered streets/markets and tried the local dish called okonomiyaki but the real cultural tour starts tomorrow with Nijo Castle, apparently that’s where I took my first steps. Did you enjoy the okonomiyaki? It’s one of my favourite Japanese dishes. 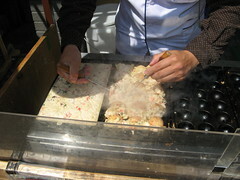 Scalding hot and tasty, with the funny wavy fish flakes on top. Mmmmmmm. 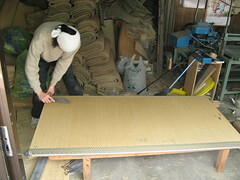 You are observant in your wonderings to spot the tatami being made. Sorry Craig, you have zero chance, I reckon, of getting getting your card sent on – and even with fluent Japanese the conversation would be a nightmare. Glad everything else is working out. Enjoying wireless in this nice cheap pension – will let you know the details if you come this way. BTW, it’s ‘tako’ = octopus. Yes, my computer’s spell check began with a confused economy yaki before I kindly put it right! 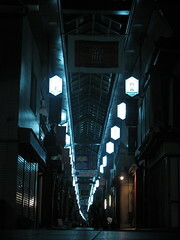 God I’m so behind on this blog… Kyoto already? Please tell me you didn’t pass through Tokyo without doing a little all night revelling yourself!! !